Finally there's a rack solution for your 5ml and 10ml pipet tips that doesn't break the bank! 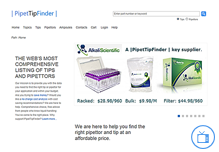 The Big Tip Box lets you save $$$ buying your large pipet tips in bulk, while still getting all the advantages racked tips. Our private label bulk pipet tips are the best value in universal fit 0.2ul - 10ml pipet tips you will find anywhere. Easily save 25-75% over branded tips with the same size, fit and quality. Every now and then, someone will voice the opinion: "I would never buy Brand X pipettor because it isn’t as accurate as Brand Y." We all have our favorite brands but are there really some pipettors that are inaccurate and imprecise being marketed today? Let’s start by reviewing what the terms precision and accuracy mean. So how do we determine what tips will fit your pipettor? We collect data published by pipettor and pipet tip manufacturers all over the world. We conduct testing in our own labs too. We have compiled this data into a searchable database to provide you with a single resource that is unbiased and not marketing driven. What is the "Perfect Tip" for You?" What is the best pipet tip to use? The answer to this question lies within another question: "What are you going to be pipetting and what level of variability can you tolerate in your results?" In other words, you should select the tip to fit the application. This is common sense that is not commonly applied. In our recent article, "How the right pipet tip can reduce your risk of repetitive stress disorder" we discussed the seriousness of ergonomically related injuries and reviewed the new FlexFit™ tip from Biotix. There are two factors that lead to stress. The force required pushing the pipet plunger and the force required to eject the tip. Pipettors that are designed for use on 384-well microplates with a 16 x 24 format pose some challenges for pipet tip vendors. The problem is that if you line sixteen or twenty four standard pipet tips up in a row that the hub of the pipet tips, when added together will be too wide for the tips to go into the closely spaced wells of a 384-well plate.